Left: Exhibition banner. Right: Cover of the book under review. 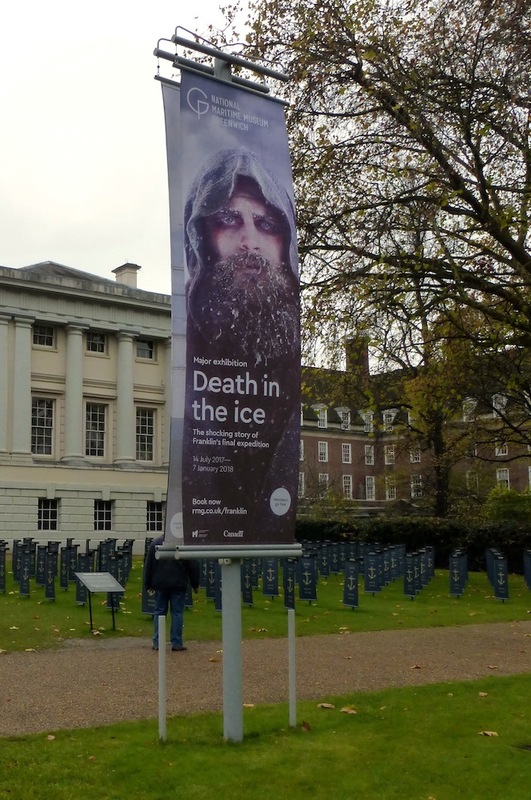 The large banners advertising the current exhibition at the National Maritime Museum, Greenwich, are in every sense chilling. 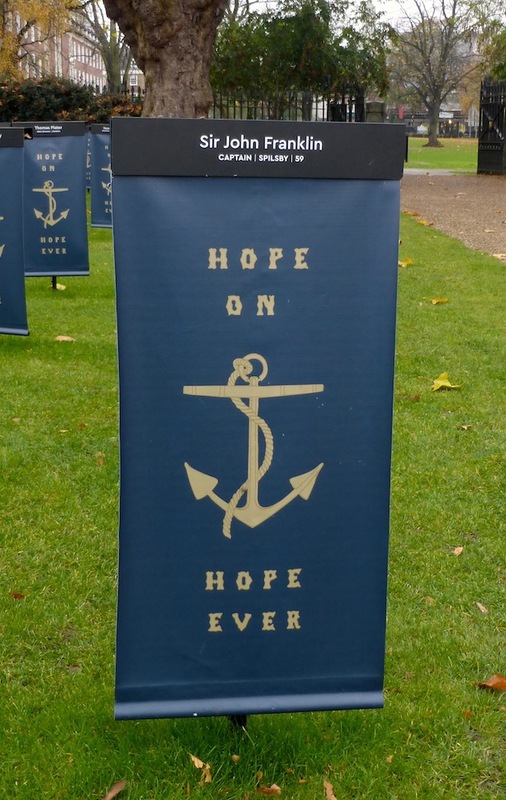 Equally chilling, despite its repeated positive message, is the installation close to the main entrance: rows of small blue flags, planted in the ground like war-cemetery headstones, each sporting a gold anchor with a man's name, rank, place of birth and age at the top, and the legend "Hope On Hope Ever" above and below the anchor. The one at the leading edge bears the name of Sir John Franklin (1786-1847), born in Spilsby (in Lincolnshire), aged 59 and captain of the doomed Franklin Expedition of 1845. This expedition was the most stirring and controversial of failed Victorian ventures, triggering a series of searches which have continued into our own times, and which have still not revealed exactly how the men met their fates. The "Hope On" motto was that of Sir John Barrow, who had been Second Secretary of the Admiralty, and a keen enthusiast for exploration. It had previously been used on polar sledge flags. The "Death in the Ice" exhibition (running from 14 July-7 January 2018), has been a complex undertaking, developed in partnership with the Canadian Museum of History and Parks Canada; it has also involved collaboration with the Government of Nunavut and the Inuit Heritage Trust. The latter has proved tricky, with issues over the removal of items from the submerged wrecks of the expedition ships HMS Erebus and Terror, discovered in Nunavut waters in 2014 and 2016 respectively. But it is clear that every care has been taken to do justice to the Inuits, both in confronting their treatment in the past, when explorers took individuals and even families home as ethnological specimens (the assistant surgeon of the Terror, Alexander McDonald, had written a book about an earlier voyage which had taken one to England); and in highlighting their roles in aiding the Franklin searches. Displays of their carved wooden maps, small three-dimensional representations of the coastline that could be held in the hand as navigational aids, and various artefacts made of mixed materials, such as a traditional Inuit knife handle fixed to a salvaged steel blade, demonstrate their skills as well as their adaptation to the harsh living conditions there, and the sporadic European presence in their territory. A prime way in which the curators involve us in events which took place long ago and far away is through audio-visual displays featuring the Inuits' remarkably accurate oral histories and testimonies: their encounters with these strange visitors and their sometimes useful detritus were, it seems, never forgotten. Left: Sir John Franklin Capt. R.N. © National Maritime Museum, London. Right: The flag bearing Captain Franklin's name. The British of this period were fascinated by the polar regions and those who penetrated them were much admired. Making the final breakthrough in the search for the North-West passage would have been a plum project for Franklin, who already had behind him an abortive expedition to in 1818, a disastrous overland expedition to the Arctic Sea in 1819-22, and the more successful one of 1825-28 for which he had received his knighthood. A new challenge would make up for his recent replacement as lieutenant-governor of Van Diemen's Land (Tasmania), where his zeal for reform had not been appreciated. As a result, when he set out on his search for the final part of the North-West passage on 19 May 1845, he did so not only with two specially reinforced and adapted ships, manned by the 133 sailors and officers serving under him, and carrying vast quantities of supplies (cattle, pigs, sheep, hens, various pets, over 7000 pounds of tobacco, enough wine for Franklin's sociable evenings for three whole years, and a library with 1,200 books), but also under the full weight of historic expectation and personal ambition. 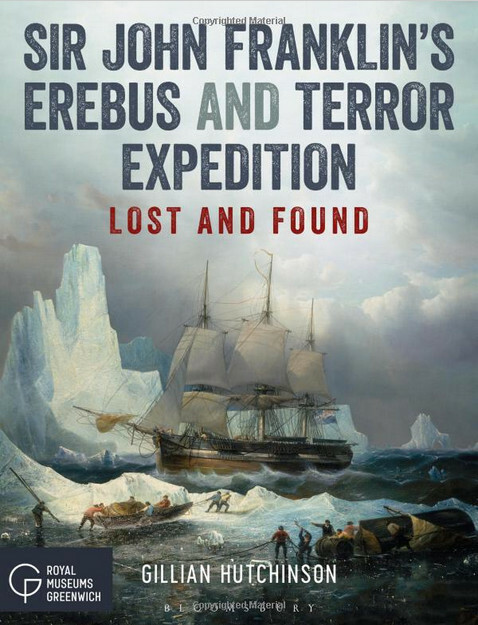 Franklin himself sailed on the flagship, HMS Erebus. Two men from each ship were sent back to England from Greenland before the expedition began, because of ill-health, leaving a complement of 129. There were two trainees or "Boys" on each ship, aged 18 or 19, and there were thirteen Royal Marines between the two ships to keep order, defend the ships when expeditions were sent out, and so on. As Arctic crew members, the men received double pay whilst away. Although the exhibition labels are very informative, some of these fascinating details can be better assimilated from Gillian Hutchinson's book about the expedition, which is much more than a simple guide (a smaller book by Karen Ryan, with the same title as the exhibition, is available for that purpose). For instance, Hutchinson tells us how the men allocated their pay (and in two cases, insurance pay-outs) to their families, showing, amongst much else, that even with the double rate of pay the ordinary seamen and captain's stewards earned not much more than a navvy might receive at home (£3.8s. compared with £3.00; see p. 71). Both the exhibition and the book benefit from the fact that Franklin's wife, Lady Jane Franklin (1792-1875), arranged for daguerreotype photographs of all the officers before the expedition left: Franklin himself looks distinctly seedy in his (he was suffering from influenza at the time) and his senior officer on the Erebus, Commander James Fitzjames, then aged 31, looks both considerably younger and far more cheerful. Getting some insight into the personalities of these men and the rest of the expedition members is immensely helpful in drawing us into their experiences. 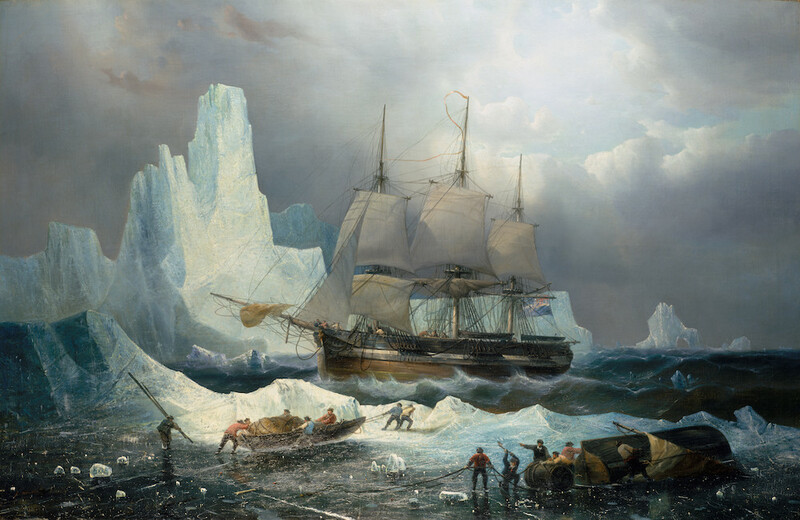 HMS Erebus in the Ice, by François-Etienne Musin, 1846 © National Maritime Museum, London. Despite the general optimism about finding and charting the last part of the passage from the top of North America into the Pacific, both the men and their families were well aware of the trials ahead. The ships were expected to be at anchor in some sheltered harbour during the winter months, and provision was made for this both with supplies and arrangements for passing the time: exercise, organised entertainments, educational pursuits. Life on board would be a microcosm of Victorian society, minus the womenfolk. As spring approached and temperatures began to rise, the men would be able to do some sledging, with the aims of prospecting the land, finding out about whatever life it supported, and hunting to augment their rations. It was never expected to be easy. On a previous expedition, Franklin and his companions had been forced to eat hide from clothes and boots to keep alive — something that had earned him the nickname of "the man who ate his boots." But it was expected to be perfectly doable, and to yield various kinds of knowledge as well as that all-important shortcut for shipping. Left: Sketch of the recent discoveries on the northern coast of America by Captain McClintock RN in search of Sir John Franklin, c. 1859. © National Maritime Museum, London. 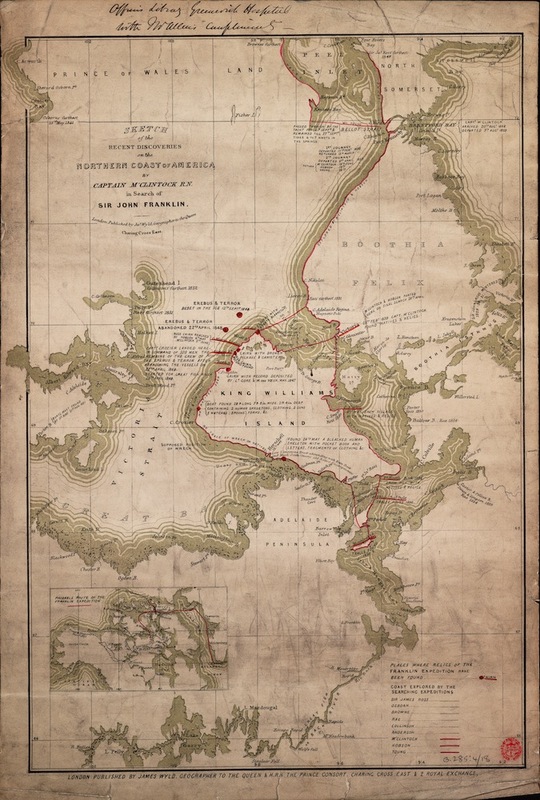 In the middle is King William Island; the red spots mark the places where the ships had been first beset by ice, on 12 September 1846, and then abandoned, on 22 April 1848. 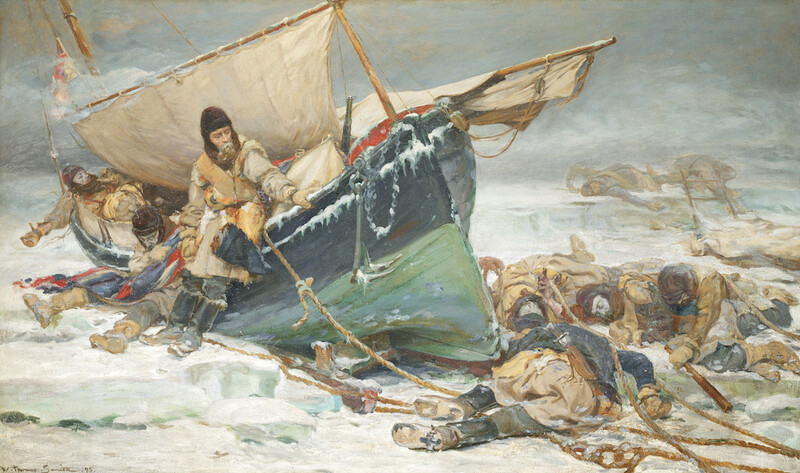 Right: "They Forged the Last Link with Their Lives — Sir John Franklin's men dying by their boat during the North-West Passage expedition," by William Thomas Smith, 1895. © National Maritime Museum, London. So when there was no word from the expedition by January 1847, alarm bells began to ring. Thus began the terrible and prolonged uncertainties surrounding the ships' fate. The subsequent search parties, from 1848 onwards, urged on by the indefatigable Lady Franklin herself, continued even after the remains of the expedition's winter camp and the first graves had been discovered, and indeed even after Lady Franklin's death in 1875. The last searches of the nineteenth century were the expedition led by Charles Francis Hall, who worked with the Inuits Taqulittuq and Ipivik in the later 1860s; and Frederick Schwatka's searches in 1878 and 1879, which turned up more Franklin objects (like a sledge harness from Terror, and a soup tin) in different parts of King William Island, and found burial places there, in what Captain McClintock on an earlier search had christened Erebus Bay. The most recent discoveries of both the submerged ships in September 2014 and 2016 have added enough to their insights and material to draw us more closely into the men's awful fate — although mysteries remain. Left: Smaller relics of the expedition, including the hopelessly worn and cracked sea boot. Right: HMS Erebus illuminator (fitted light) in situ © Parks Canada, Marc-André Bernier. As well as maps, audio-visual displays, likenesses, paintings and so on, the exhibition includes a variety of items discovered on the searches. These range from packets of needles found in 1859 at the abandoned campsite at Cape Felix, on King William Island — thousands of such packets were carried on the expedition, for bartering with the Inuits — to a small jagged fragment of window-glass from the Captain's cabin of HMS Erebus, found in our own times. The more personal the item, and the more known about it, the more moving. For example, there is Franklin's table cutlery, bought back from the Inuits, some blue willow-patterned plates from his ship, and a hopelessly dilapidated sea boot found at the all too aptly named "Starvation Cove." The faint background noise of gusting wind, and video screening of the Canadian divers examining the wrecks, and speaking to us from underwater as they do so, give a strange immediacy to the visitor's experience. Most disturbing is a small section (with a warning at its entrance for those of tender years or fragile nerves) showing full-size photographs of the bodies of crew members who died early in 1846. Having been buried deep in the ice, they are horribly well preserved. 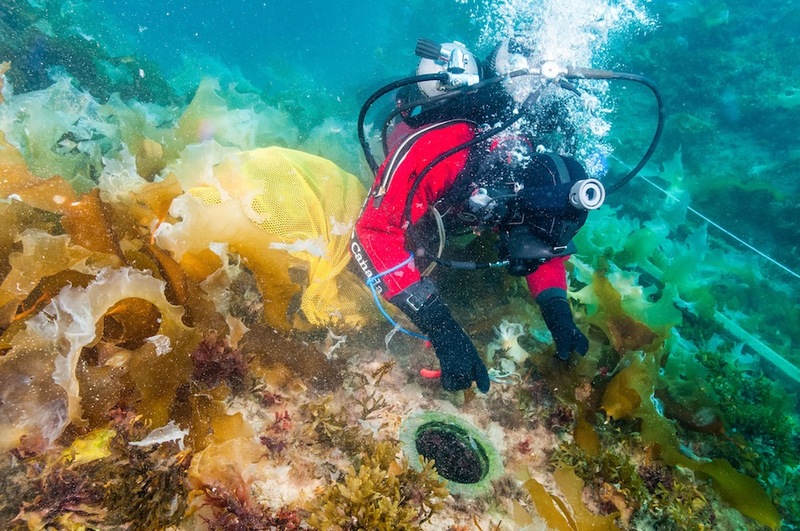 HMS Erebus bell in situ © Parks Canada, Thierry Boyer. 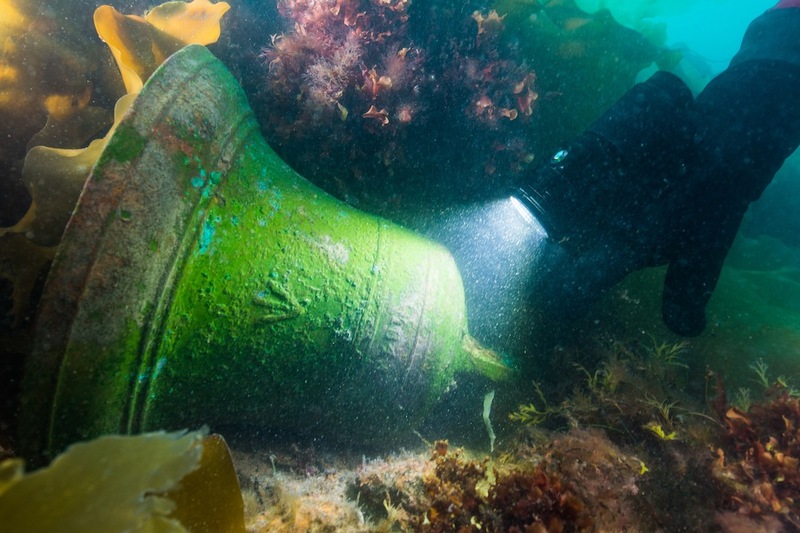 The bell was the first artefact recovered from the ship. Now that the ships have been found, as well as earlier proofs of the expedition's collapse, what mysteries surrounding the men's fate remain unsolved, and are we any closer to unravelling them? The main mystery, about the actual causes of death, is probably settled now. Scurvy, starvation, lead poisoning (or worse, from poorly canned food) and general inability to withstand the harsh conditions (tuberculosis was rife at that time) are all likely to have been factors. 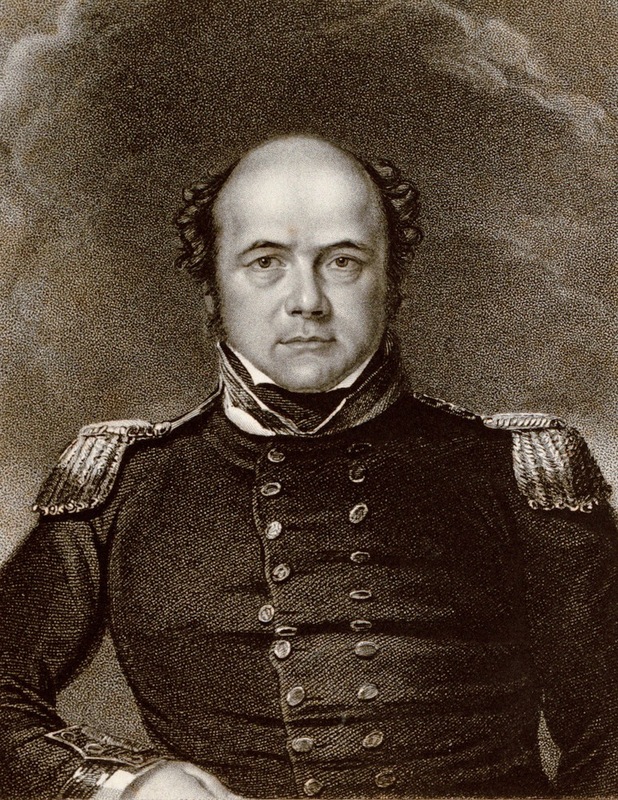 As a result of Lieutenant William Hobson's discoveries, on the expedition with Captain McClintock which yielded the useful map of the area, we already knew that Franklin's death had occurred fairly early on, on 11 June 1847, by which time only nine officers and fifteen men had perished. Captain Fitzjames took over from him. We already knew, too, from the state of some skeletal remains discovered in 1854, that cannibalism took place later in the men's ordeal. This was the worst spectre that had been raised, the one from which the Victorians themselves (including Dickens) recoiled in horror. It is clear too that in 1848 the crews of both ships abandoned them to try to walk to safety. But did some of the men return, and perhaps abandon ship again? At what point did the ships sink? In the last part of her book, Hutchinson asks many more such questions, and wonders if further investigation of the wrecks will yield at least some of the answers. The failed Franklin expedition lacks the glamour of that other least-expected and more recent tragedy, the sinking of the Titanic. There were no survivors from the Victorian expedition, and first-hand accounts are lacking. Moreover, certain aspects of it are very hard to confront: not simply hubris, not even the evidence of cannibalism itself, but the way that Dickens tried to shift the blame for this last desperate turn of events onto the Inuits, who had been so helpful during the searches. He thought it "gigantically improbable" that the British could have done such a thing, and all too probable that the "vague babble of savages" on the subject had been a tissue of lies (see his piece on "The Lost Arctic Voyagers" in Household Words). As Hutchinson says, and as the curators fully acknowledge, this rejection of the findings was nothing but a "racist fiction" (137). The calumny only adds to the burden of guilt we bear for earlier treatment of the Inuits. Those who were brought to Europe as curiosities from earlier encounters almost invariably died before they could return home. Such unpalatable truths, however, only make it more important for us to visit the exhibition. Perplexing, poignant and sometimes deeply disturbing, "Death in the Ice" is well served both by Karen Ryan's shorter guide book, which is helpful when looking around the displays, and makes a good souvenir of the exhibition, and by Hutchinson's more comprehensive book, which could be studied afterwards — or even instead, if Greenwich is just too far away to visit. It is worth trying to get there, though, for the uncomfortably immersive experience that the museum has created. In the annals of polar exploration, and also of Victorian culture, the Franklin expedition holds a very special place, and proves that failure sometimes teaches us more about ourselves than success. Jug modelled as an Eskimo, by the Martin Bros., well known for their ceramic grotesques. McDonald, Alexander. A Narrative of some passages in the history of Eenoolooapik, a young Esquimaux…. Edinburgh: Fraser & Co. and J. Hogg, 1841. Internet Archive Contributed by the University of Alberta Libraries. Web. 24 November 2017. Ryan, Karen. Death in the Ice: The Shocking Story of Franklin's Final Expedition. Gatineau, Quebec: Canadian Museum of History, 2017. Stopp, Marianne P. "Eighteenth Century Labrador Inuit in England" (PDF). Arctic. 62/1: 45–64. Web. 24 November 2017.